The seven-members of the SFMTA board unanimously approved boarding islands, transit-only lanes, and stop consolidation on the L-Taraval. Photo: Streetsblog. 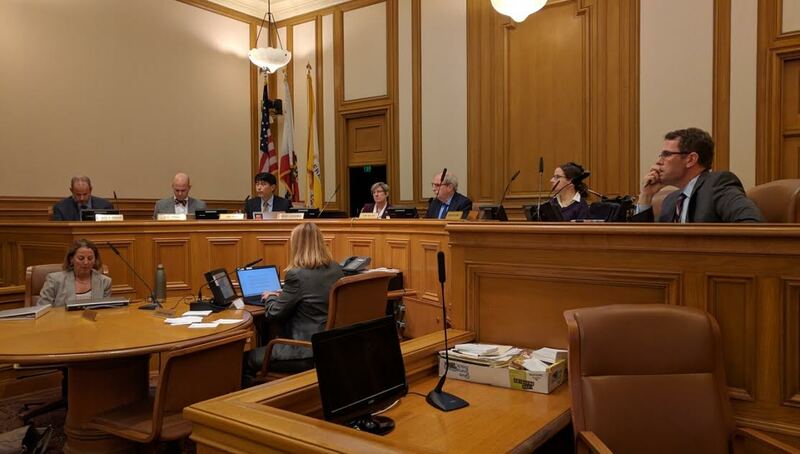 Late this afternoon, after listening to testimony from some 50 speakers for more than three hours, the SFMTA board unanimously approved the Muni-forward project to consolidate stops, create red transit-only lanes, and install concrete boarding islands on the L-Taraval line. 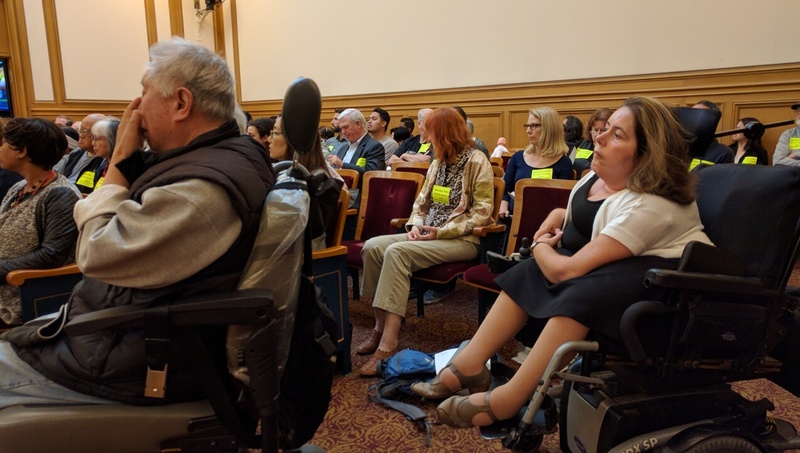 This morning Streetsblog ran an opinion piece from Walk San Francisco’s Executive Director, Nicole Ferrara, urging the SFMTA Board to ask for concrete boarding islands for all stops on the Taraval line. The board members shared her concern about the five inbound stops that will get painted passenger boarding areas, rather than concrete safety islands. “It’s not ‘Vision 90 percent,'” said director Joel Ramos, referring to an SFMTA qualification in the plan that says if less than 90 percent of motorists respond to the new painted treatments at these five stops in question, then these stops will also get a concrete safety island installed later. Despite the concerns, they decided to move forward with the plan in hand. “I just can not see continuing to drop people off into traffic,” from the train said Lee Hsu, another of the directors. Streetsblog will bring more details on the meeting in a follow-up post. It’s sufficient to say for now that the concrete boarding island issue is essentially resolved, and, despite the pleas of local merchants and residents who came to the meeting, parking concerns will not trump safety on this project. “It’s not ‘Vision 90 percent”? I guess we can quibble about the number, but see the previous post, which starts right off with “the 12% of streets responsible for 70%”. Yay. Where I grew up (DC), ALL opf the streetcar stops in the streets had safety islands. I was appalled when I moved here 46 yearws ago to discover that SF didn’t. This is good news! The SFMTA board made the ethical, responsible choice. It’s an insult to me when people oppose the boarding islands. I’ve nearly been hit, witnessed others nearly get hit, and heard of many who have been hit by passing vehicles. What does it take for them to change their minds? Witness a person getting hit and killed? It’s been an ugly tradition around this city when safety improvements are done quickly because a pedestrian was KILLED. Some places includes 47th and Fulton and multiple non signal crosswalks along Sunset Boulevard. I appreciate the SFMTA saying they want improvements before things finally gets real bad. Amen! Keeping people alive and uninjured should always take priority. Fabulous decision, SFMTA Board!! Well, at least San Francisco didn’t get rid of its streetcars like DC did. Yesterday around 5:45pm I was getting off the L at 28th Ave and some ^$*@#$*#! @ speeding down the street failed to stop when the train doors opened and nearly wiped out a few riders, including myself. When someone is barreling down the street at 35-40mph you have little time to react when sticking your head out of the door before stepping off the train. If the boarding islands hadn’t been approved my suggestion would have been to sue the city for endangerment to riders. Clang, clang, clang went the trolley. You’re right. Instead, DC got a real mass transit system and SF kept itself tucked away in the early 20th century. (1) Remove half the stops and build boarding islands. (2) Make sure the boarding islands can handle 2-car trains. And we did get BART, FWIW. As for trolleys, it’s back to the future! The article title should changed to better reflect that SFMTA did not unanimously approve boarding islands, the Board approved a pilot project instead of boarding platforms. It’s not ‘Vision 90 percent,’” said director Joel Ramos, referring to an SFMTA qualification in the plan that says if less than 90 percent of motorists respond to the new painted treatments at these five stops in question, then these stops will also get a concrete safety island installed later. Director Ramos seems to have some problems with simple math. Only requiring drivers to obey the law 90% of the time sure sounds like “Vision 90 percent”. Yeah, Metro is “real” and covers a heck of a lot more territory in DC than BART does in SF. Perhaps you should get out and ride more transit systems. Bwahahahahaha. More power to you if you want to ride the Rice-A-Roni trolleys. Most riders would opt for better transit options. Regarding the quote you highlighted, wouldn’t it seem ironic that pro boarding islands/concrete safety islands people, would deliberately blow through stopped trains so the city is forced to make them? I’m still confused. Can someone clarify? Are they installing concrete boarding islands at all 16 stops, or are they doing the painted ‘stop here’ markings at 5 of the 16 stops? By “ironic” I’m guessing you mean “a good way safe street advocates could organize a way around Mr-10-percent-is-acceptable-losses” without it costing someone’s life. It’s also not like there aren’t stunt performers who could convincingly fake a crash where one ends up on the others hood, surprisingly injury free considering how close to death she/he came. Next time that happens, make sure you go across the street to Great Wall and tell them that they’re creating a dangerous environment. @p_chazz – Something something plural of anecdote not something. WMATA has its problems, but it has its successes as well. @Mark – 3-car trains are (back) in the works. Then there was the woman who was raped on a moving Metro train, the Metro police officer who was arrested for aiding ISIS, reports that the whole system may need to shut down for six months to make repairs…the list just goes on and on. A bit more than anecdotal data, wouldn’t you say? In fact, by any metric, Metro is a system in decline. More to the point, BOSTON has safety islands for its streetcars, and they’re older than San Francisco’s. So SF really does need to catch up. Still, at least in SF it’s just a matter of catching up. The stops without boarding islands have been like that basically forever. It’s not like some of the regional rail stations on SEPTA, where they used to have platforms and the platforms were actually *removed* in the 1960s / 1970s, leaving the trains stopping at asphalt patches on the side of the tracks. So this is a slightly weird plan. Ulloa & Forest Side Avenue — remains as dangerous as before. ….I think you can see where this is heading. In the long run the list of accessible stops may simply become the full list of stops. The spacing is a pittle too wide for my taste and I think they need to do something about the gap between West Portal and Taraval/19th, and the gap between 19th and 30th. I was thinking that, but feared putting ideas in people’s heads. If someone let slip when the SFMTA staffers were doing the study to determine whether the 90% standard was achieved, a sufficiently eager activist could start driving around the block passing stopped trains (ideally without, you know, hurting anybody) to drag down the average. Of course, I would never interfere with a traffic study, nor would I advocate that anybody do the same, and knowing drivers in SF, I suspect the 90% standard won’t be reached even without any such mischief, but this pilot program does create some perverse incentives indeed.